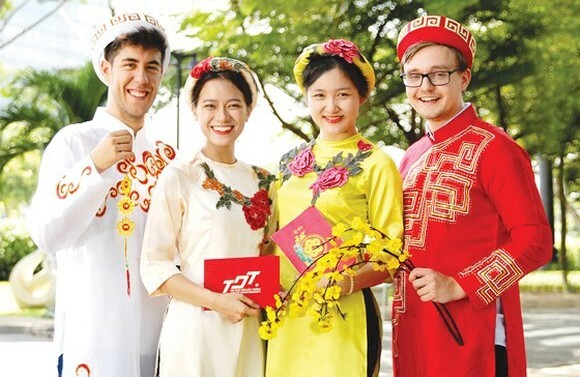 International students are pursuing learning in colleges in Vietnam generally and Ho Chi Minh City particularly have different perception of Tet holiday (Lunar New Year). 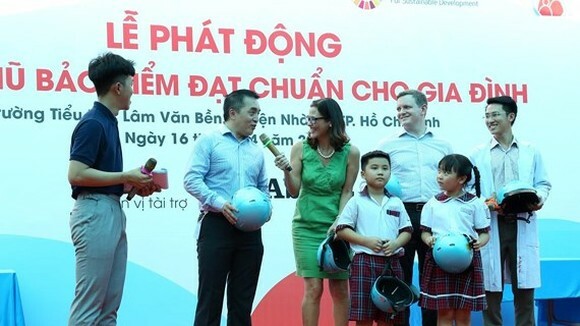 To help foreign students perceiving Vietnamese Tet holiday, schools have organized various programs. International students felt interesting in the traditional festival of Vietnam. Laotian student, Sisomphone-Wassanasong, who is learning in Ton Duc Thang University said that he has stayed in the country for three years and enjoyed good atmosphere of the special holiday through program for overseas students held by the university. At the festival, students were gathering with lecturers creating warm atmosphere like uniting with my family, Sisomphone-Wassanasong said. Sisomphone-Wassanasong said moreover, on the occasion, he could have traditional cakes of Vietnam like chung cake - rice cake with four-cornered dumpling made of glutinous rice wrapped in rush or bamboo leaves and boiled and tet cake - Cylindric glutinous rice cake filled with green bean paste and fat pork and receive a red packet. More importantly, people wished him good health and luck in the new year. Laotian student said Vietnamese Tet holiday is like Laotian because it is the time of reuniting with siblings and relatives. 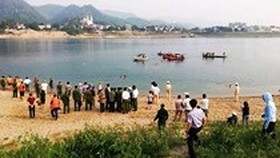 Laotian people splash water on others as a show of blessings and good wishes while Vietnamese give lucky money and make traditional cakes. 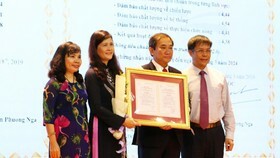 He added he felt joyful at Vietnamese culture. 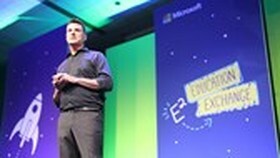 He sent best wishes to teachers and friends on the New Year. Korean student Kang Soyi of the National University in HCMC said that he had lived with the parents in Vietnam before entering the school; accordingly he gets used to the festival. He remarked Vietnam and Korea have many similar features in welcoming Tet holiday, as a result, he can perceive well the bustling atmosphere in last days of the year (the lunar calendar). Korean Tet holiday also called Seollal is one of the most important traditional Korean holidays and last in three days, said Kang Soyi. He recalled his family went to their grandparents in a province and celebrate with them because this is the mere opportunity of reuniting to celebrate the festival. On arriving the grandparents, he washed with hot water to eliminate all dust on the body and wore the new traditional costume Hanbok as well bow before ancestors. Later he played games, chess, cooked and chatted. Living in Vietnam, his family can’t do all above-mentioned activities; yet, Vietnamese holiday is rather similar to Korea’s. He is interesting in Vietnamese traditional Tet holiday because his classmates told them how they welcome the new year in their hometown which are little different from places to places. Moreover, he highly appreciated the aids to disadvantaged people in these days because he believed all people should have good holidays. Thai student Janthamongkhon Ketsuda of Ton Duc Thang University has different perception of Tet holiday in Vietnam. He said every people are preparing all for the holidays. One of his friend told him that the first day of the year (according to the lunar calendar) will send wishes to father, the second day to mother and the third to teachers to receive lucky money. Thai people will bath Buddha and splash water on all people to wash away sorrow to welcome the New Year whereas Vietnamese people try to return hometown to reunite with relatives.